The Thomaston Baptist Church is privileged to worship in a beautiful sanctuary graced with ornate stained glass windows. For a virtual tour of our sanctuary, click here. Since many of the symbols in our sanctuary may be mystifying, we have included a description of some of them here. 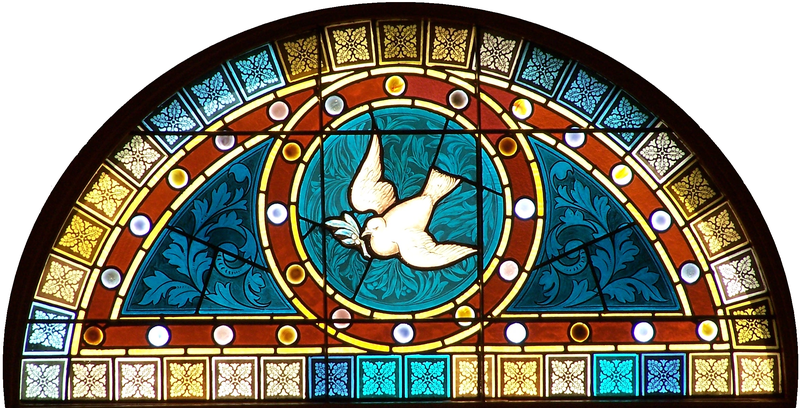 The Dove with an Olive Branch is a symbol of peace, renewal, and God’s friendship toward human kind. Noah sent a dove from the ark, and when it returned bearing an olive branch in its beak he knew that the Great Flood had subsided and it was safe to leave the ark. Thus the dove came to symbolize a new beginning. God had saved his creation, including human kind, from the evil forces that had been unleashed in the world. In that way the dove with an olive branch also became an environmental symbol: God cares for this good world that he created. 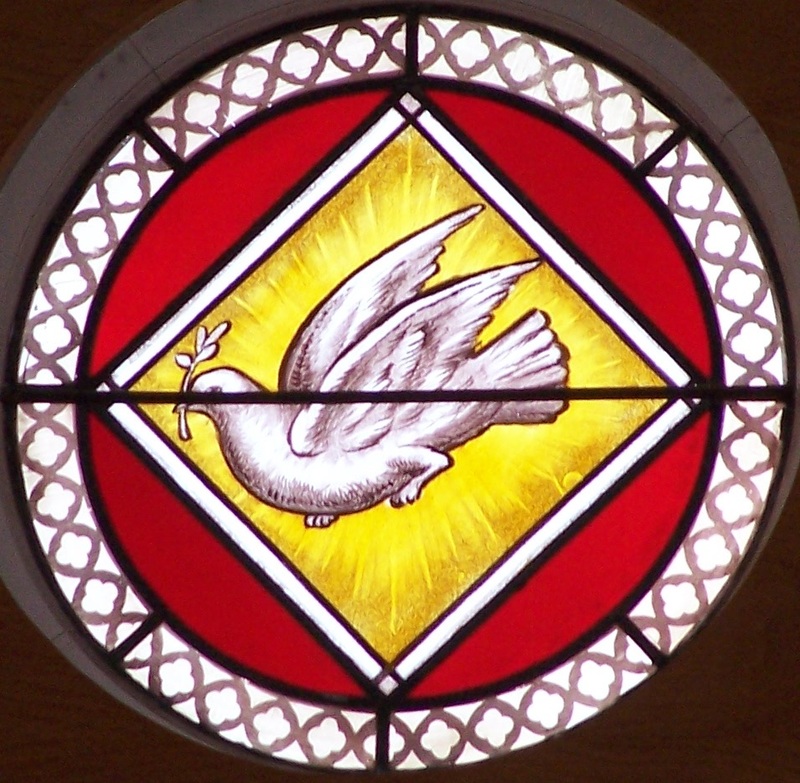 In the Gospels the dove symbolizes the Holy Spirit who anointed Jesus for his redemptive task when he was baptized by John in the River Jordan. The Crown is a symbol of God’s sovereignty. God’s merciful reign brings peace, justice, and freedom to our world. The Kingdom of Heaven, God’s redeeming power breaking into our world to uproot evil and vindicate everything that is good, is the main theme of Jesus’ message. According to Jesus, the Kingdom of Heaven is neither a place we can visit nor a time we must wait for. The Kingdom of Heaven is rather God’s redemptive activity. Whenever the sick are healed, whenever demonic powers are driven out, whenever justice is restored, whenever the oppressed are set free–that is the Kingdom of Heaven breaking into our world. The Holy Bible is a collection of books written by many different authors at many different points in history through the inspiration of the Holy Spirit. 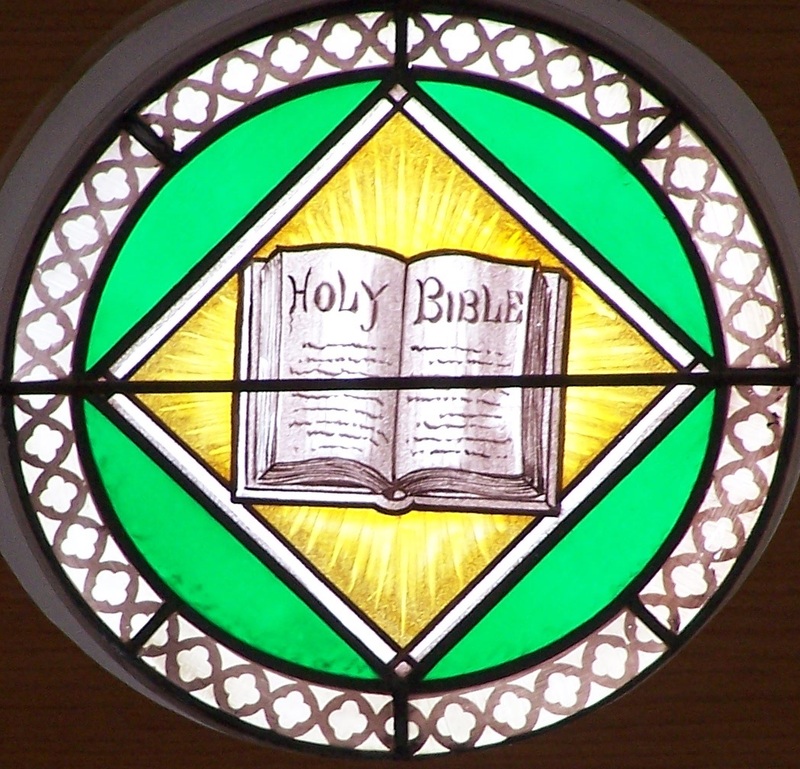 The Bible is often divided into the Old Testament, the Hebrew Scriptures we share with our Jewish friends, and the only Scriptures Jesus knew, and the New Testament, written in Greek by the Apostles and their associates to testify to the life and teachings of Jesus and to guide the Church in its mission. 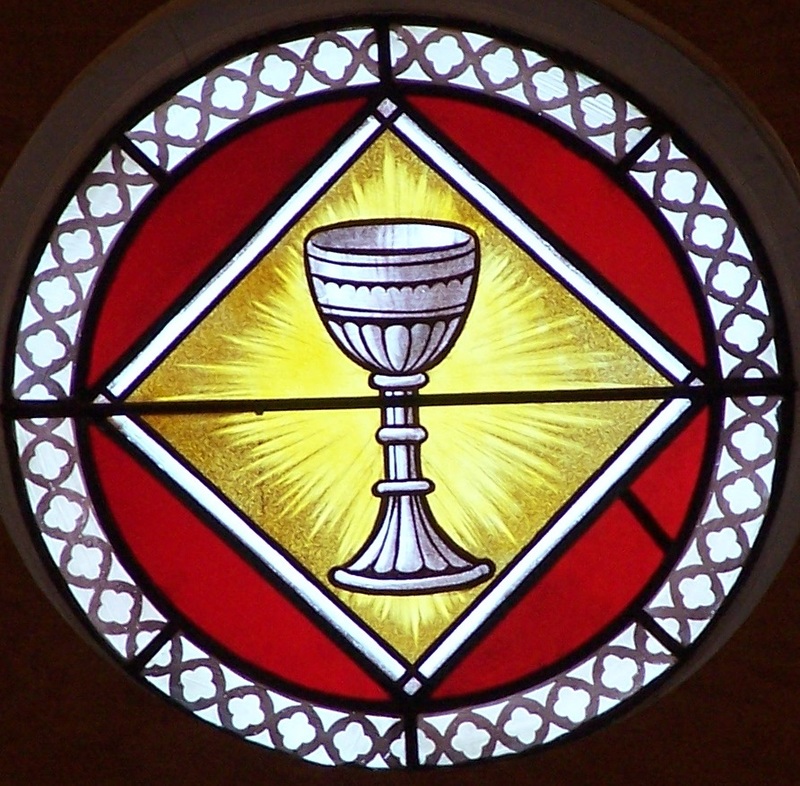 The Chalice is a symbol of faith and worship. A cup of wine is a symbol of joy and at the Passover cups of wine are drunk in celebration of God’s redemption of Israel from slavery in Egypt. Jesus connected the redemption from Egypt to the redemption God was bringing to Israel and all the peoples of the world from the tyrrany of evil by referring to the Passover cup as the New Covenant in his blood. Jesus’ faithfulness to God and his mission, even at the cost of his life, brought us freedom from the power of Sin and Death and opened the way for God’s power to break down the strongholds of evil in our world. 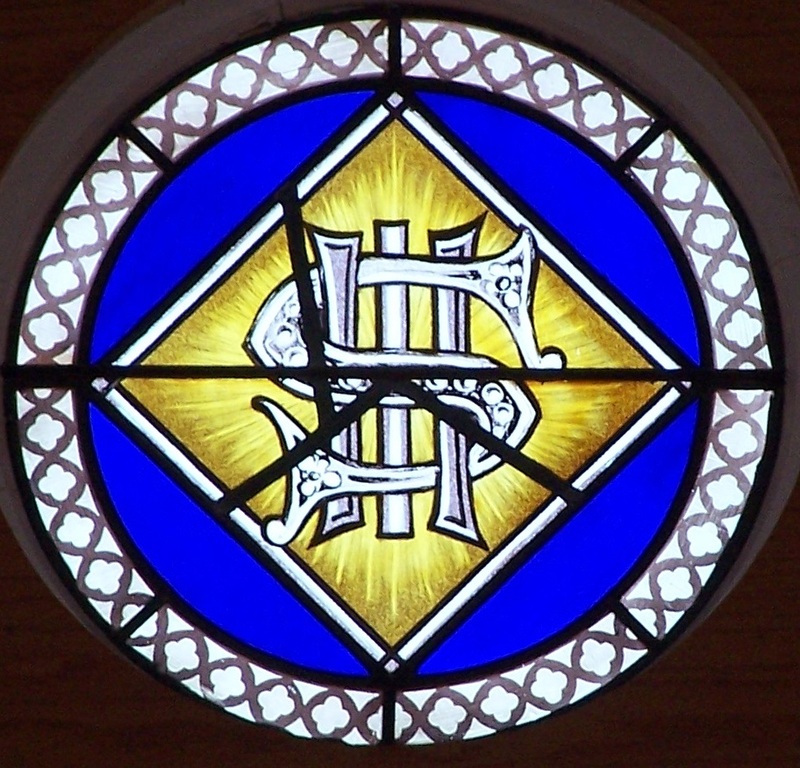 This is not a dollar sign ($), but the combination of the Greek letters Ι, Η, Σ, which are the first three letters in the name ΙΗΣΟΥΣ (Ιησους, “Jesus”). The name Jesus is related to the Hebrew word ישוע (yeshua, “salvation”). 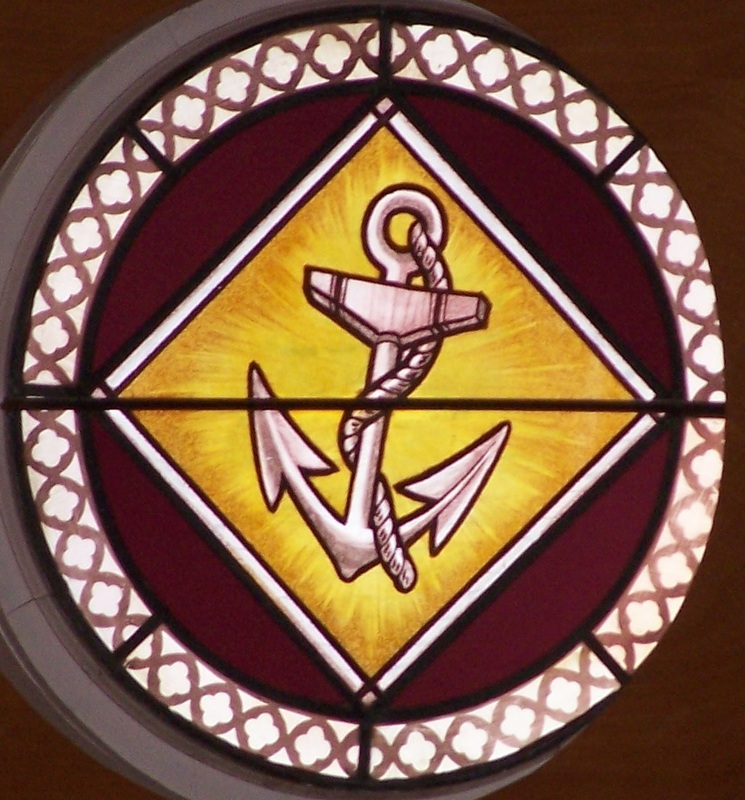 The Anchor is an ancient Christian symbol which recalls the form of the cross and is a reminder of Jesus command to be “fishers of men.” This nautical symbol of the Christian mission is particularly favored in coastal communities, such as ours. 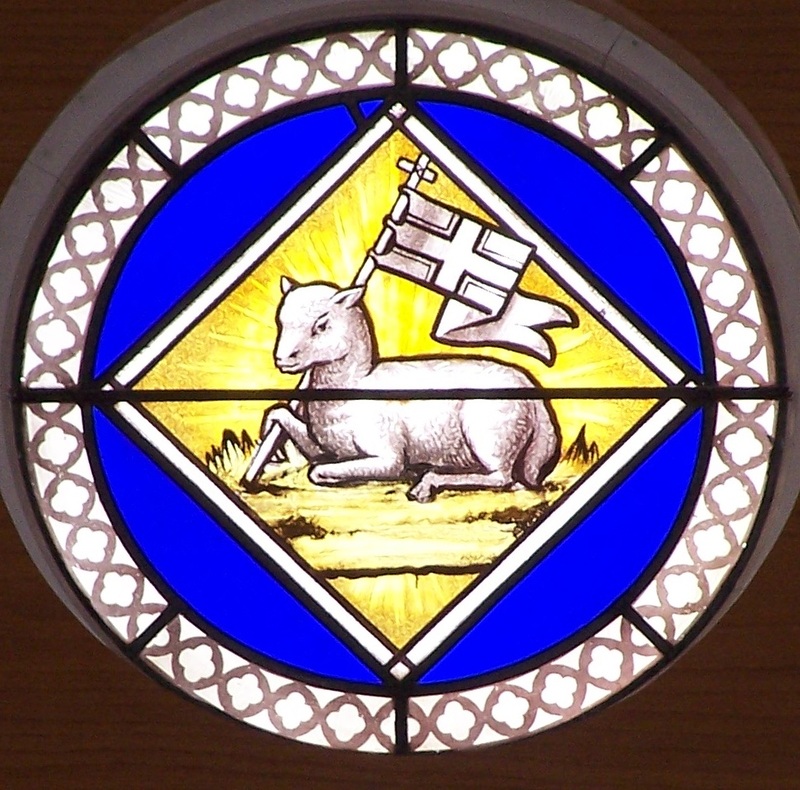 The Agnus Dei, Lamb of God, here shown with a flag unfurled, is a sign of Jesus’ victory over death, which was accomplished when God raised him to life in vindication of Jesus’ faithfulness. John the Baptist hailed Jesus as the Lamb of God who takes away the sin of the world, possibly an allusion to the story of the Binding of Isaac (Gen. 22), when God provided a lamb in place of the offering of Abraham’s beloved son. According to biblical tradition the sacrifice of Isaac’s lamb became the foundation of the Temple, since it was on that very spot that the Temple was later built. 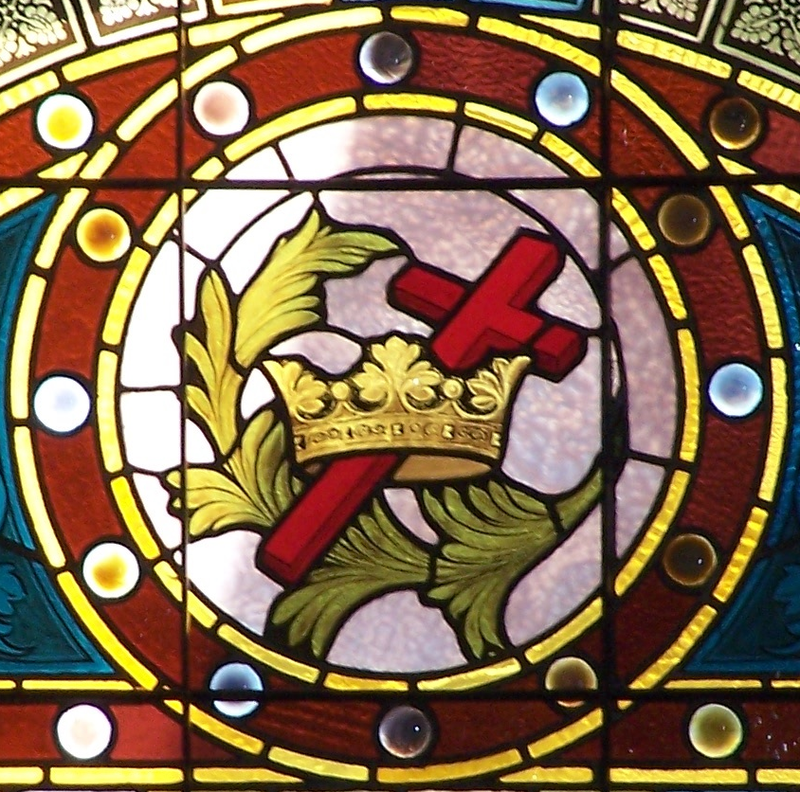 The Crown and the Cross symbolizes the way Jesus inherited the throne of David: not through violence and bloodshed, but through peaceful faithfulness even unto martyrdom. God vindicated Jesus’ faithfulness by raising him from the dead, thereby proclaiming him to be the Messiah, the Anointed King of Israel. By virtue of that exulted status Jesus is also Lord of the entire world. Yet he remains the Prince of Peace who brings healing to the nations.